Kit Now Includes Two Fermentors! 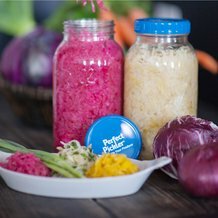 Make fresh, nutritious pickles, sauerkraut and more right on your countertop - no heavy crocks, cultures or cooking required. Jar-top fermentors fit onto wide mouth canning jars (you provide). Just add water and your desired vegetables, plus sea salt. Note: Pickles must be refrigerated after fermenting. These kits are not for canning. 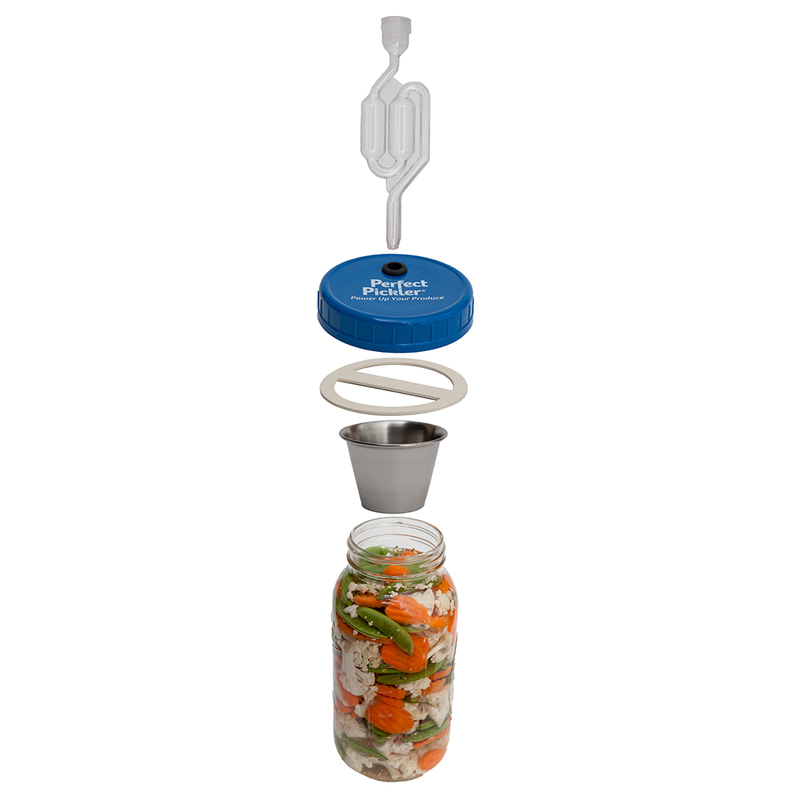 How the Perfect Pickler® works: Air-lock lid keeps air out of jar while overflow cup catches excess brine. Water and sea salt transform contents into delicious brine pickles, which are naturally full of vitamins, minerals and probiotic cultures. After 4-10 days of fermenting, check to see if contents are sour enough to your taste. If not, add a day and re-check. Kit fits 1/2 pt, 1 pt, 1 qt or 2 qt wide mouth canning jars (not included). 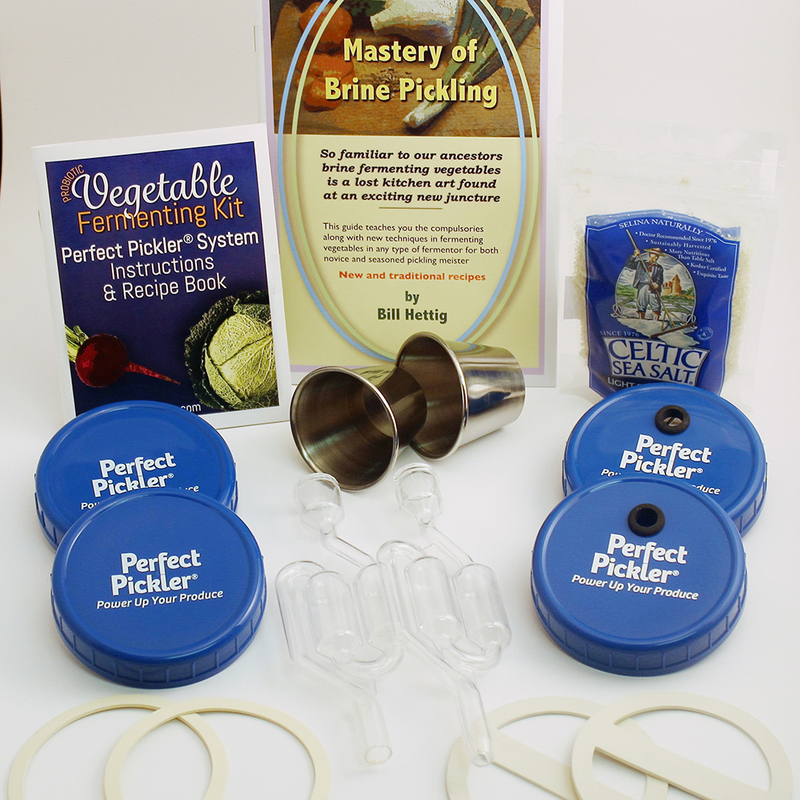 Perfect Pickler Fermentor Value Kit Kit Now Includes Two Fermentors! This worked very well and the Kimchee turned out great. The airlocks are a big help. Pretty expensive for two plastic airlocks,4 lids and two little pamphlets. You might do better just buying a couple of airlocks someplace.